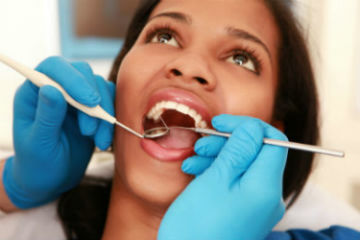 Some of the most common dental procedures include cleanings, regular maintenance, and cavity drilling and fillings. Another common dental procedure is wisdom teeth extraction. While not everyone needs to have this done, many people find problems and issues with those far-back reaching teeth are more than cause for removing them. The need to extract the wisdom teeth is typically an adult or teenage occurrence since the last set doesn’t erupt until the late teens and early twenties. The question is why do wisdom teeth so often need to be removed? The truth is, for some lucky people, they don’t. The teeth manage to erupt from the gum without disturbing or damaging the molar next to it. These people are able to brush and floss the hard to reach area with no difficulty. For all of the others though, wisdom teeth have a habit of becoming impacted, or unable to break through the skin, causing pain and, possibly infection. It is also common for wisdom teeth to only partially erupt, typically from not having enough space in the mouth. When this happens, in addition to the pain associated with an impacted tooth, food particles and debris can become lodged under the open gum. Since it is virtually impossible to remove it, infection is often the result. It’s true that no one actually looks forward to a wisdom teeth extraction, unless the patient is simply looking forward to no longer experiencing the pain. In reality, the process is performed for minimal discomfort to the patient. Local anesthesia is used to block the pain receptors in the area, and the qualified dentist or oral surgeon takes care of the problem. Many people choose to have sedation used as well. The sedation medication puts the patient in a deeply relaxed state and many don’t remember much, if anything, of the process. Recovery from wisdom teeth extraction is fairly simple as long as the patient follows the recovery guidelines. Patients can expect some discomfort and minor bleeding from the extraction site. Most dentists prescribe pain medications for the initial period following the procedure. It is also recommended to eat soft foods for the first few days as well. Dr. Mechael and her staff at the El Cajon Family Dental Office are equipped to help you and family with everything from dental hygiene maintenance, to implants, to wisdom teeth extractions. Call today for a consultation.